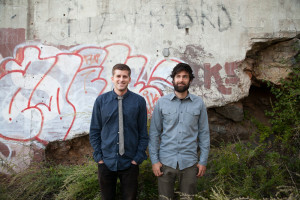 Dreamtigers is the songwriting collaboration of Jake Woodruff and Andrew Gary. Their nostalgic, dynamic and folk-tinged indie rock songs take shape through many rounds of mutual revision, drawing on nearly a decade of collaboration to create a sound at once new and familiar. It’s the sound of New England troubles, over a beer with a friend. Wishing Well, their debut LP, is the first in-depth realization of Dreamtigers’ vision. Joe Longobardi and Mike Moschetto are valuable new additions to the lineup. Longobardi, who plays in Defeater with Woodruff, lends his drumming expertise to the outfit, at times explosive and always tasteful. Moschetto engineered the bulk of the tracking and now lends his bass chops to band. A slew of guest appearances, including members of Caspian, Balmorhea, and Polar Bear Club, make this a record not to be missed. Dreamtigers has shared the stage with O’Brother, Daylight, Defeater, Caspian, Tigers Jaw, Aisha Burns, and many more acts throughout the US. Catch them supporting Wishing Well in 2014 with a melodic and impactful live performance.